For complete order details on the PAL-2P and PAL landscape lighting accessories available, click here. 1. Plug the Transformer into an Approved 240V G.P.O. 2. With the Transformer mounted in a suitable position, the PAL-2P light fittings with the selected length wires should now be located into their positions to obtain the desired lighting effect. 3. The wires should be terminated in the transformer as shown on the connection drawing and run to the selected position. Any spare wire should be just coiled up and buried in case the light fitting has to be relocated in the future. 4. The wire from the light fitting to the Transformer is a SAFE 12V so the wire can be just buried in the garden taking care the wire will not be subjected to any mechanical damage. 1. Remove the clip-on lens cover and unscrew the (6) six lens screws to unclip the lamp from the lamp socket as shown on the Assembly drawing. 2. Replace the Lamp. Note: To ensure reliable operation of your PAL it is essential to use a genuine PAL-2P Lamp/Seal Replacement kit part no. 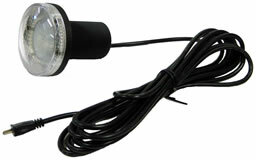 39-2DL20 or BAB/CG 20 watt Xenon Lamp with UV Cover Glass. NOTE: The Maximum Wattage on the PAL-2P is 20 watts. When the lamp is replaced it is recommended to maintain the water tight seal that the "O" ring be also replaced, the "O" ring seal is supplied with the Lamp/Seal replacement kit. 3. When reassembling the PAL-2P fitting ensure the "O" ring is sitting correctly and replace the (6) six lens screws and ensure the screws are not overtightened.